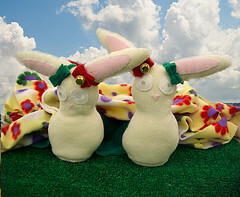 Lainey & Blainey are two talentless bunnies who want to be famous. They came to the city in hopes of finding fame, but instead found that no one would take them seriously, (that and the fact that they didn't have any talent either) so instead they went and did a webcam show for people. They perform 3 simple acts right now, (they're not very smart either) so it'll take us a while to teach them a few new tricks. Their show runs into the next few weeks so check them out. Please note performance times are not yet posted yet. the bunnies performing live in our class. 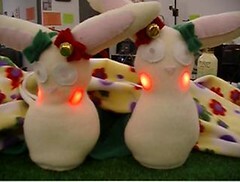 Bunnies blushing cause they won't kiss each other. 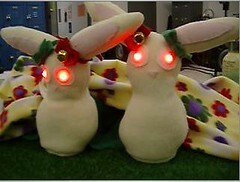 what kind of people out there want 2 bunnies to kiss each other? Bunnies are MAD cause someone told them to lose weight! You don't want an angry bunny. The bunnies shake their stuff and you can hear the bell on their bows jingle a bit. To see the works in process of this project go here. It's kinda funny that people were walking around in the background. You should definitely check out the financial aspects of attending a fashion design school. You should try to find out whether you can afford the kind of expenses involved when studying in a foreign country.